THE BRILLUSTRATOR: Darkwing Duck! First sketch posting! OK, first posting of a sketch! 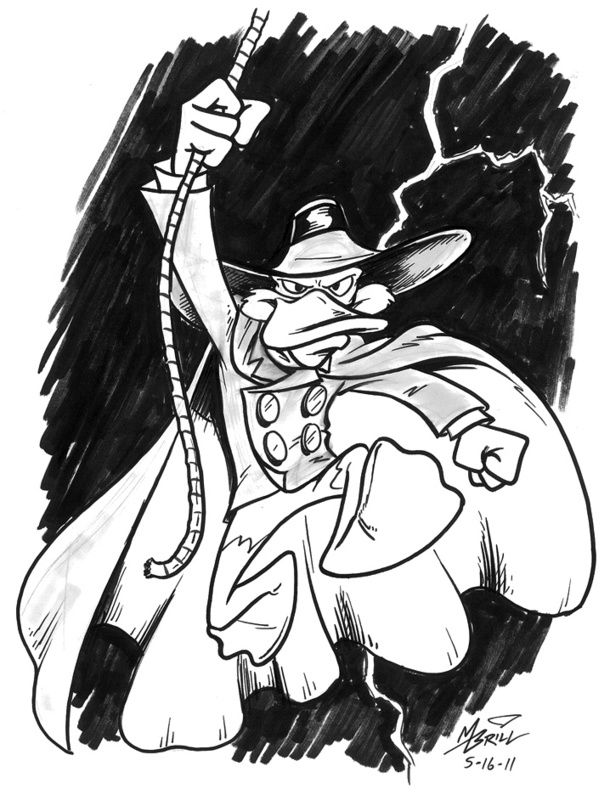 I decided to do Darkwing Duck because I've never drawn him before...and he's just cool! HOWEVER, much improvement needs to be made! This sketch took WAY too long--about half an hour. The idea here is to develop a fast style for convention sketches, so I need to get these sketches down to 15 minutes, twenty at absolute most (and preferable ten on average.) Granted, I DID do a whole body shot, but it still just took way too much time. So, I definitely need to get that streamlined. Also, the shading marker I had turned out to be nearly dried up--need to get new supplies. That should be 15 minutes for paid sketches and two minutes for small freebies.